Oddly enough, the biggest and most elaborate burial place for a President of the United States belongs not to Washington, Lincoln, or FDR, but to James A. Garfield. The 20th President served just 200 days, most of which were spent slowly succumbing to what would have been a relatively harmless gunshot wound in the back. Upon his death in September 1881 he had been president a shorter time than anyone save William Henry Harrison, who, as every schoolkid knows, caught a cold at his inauguration and lasted only 30 days. 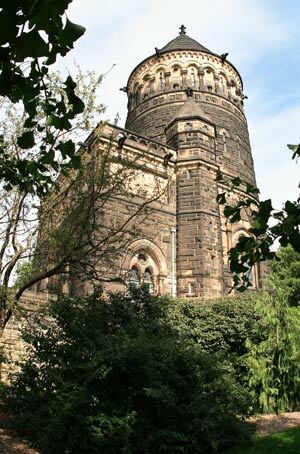 The Garfield Monument is open daily April 1st through November 19th from 9:00 AM until 4:00 PM and is staffed with a guide. The crypt is directly below the Memorial Hall and the larger than life marble statue of Garfield. After Garfield died, his body was moved from Elberon, New Jersey back to Washington D.C. He was given a procession down Pennsylvania Avenue before placing his casket on a funeral train for the trip to Cleveland. Here his coffin was placed on a platform in Public Square for viewing, the same spot Abraham Lincoln's casket was displayed years before. A funeral then cortege took his remains to Lakeview cemetery with interment in a temporary vault. In 1890 his permanent massive brick tomb with its observation deck that affords a splendid view of Cleveland was ready and President Benjamin Harrison officiated at the dedication. 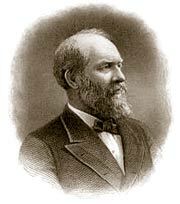 President Garfield's coffin was set in full view in the downstairs crypt. Thirty six years later Lucretia was placed by his side. 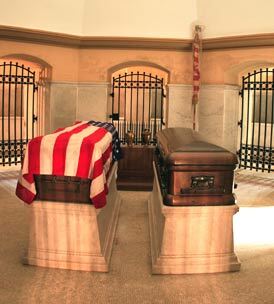 The tomb is unique in that the caskets are visible suggesting a permanent visitation or a laying in state. It is easy to tell one from the other as the Presidents casket is always draped with a brightly colored American flag. On a nearby pedestal are the urns which contain the cremated ashes of Garfield's daughter and son-in-law.